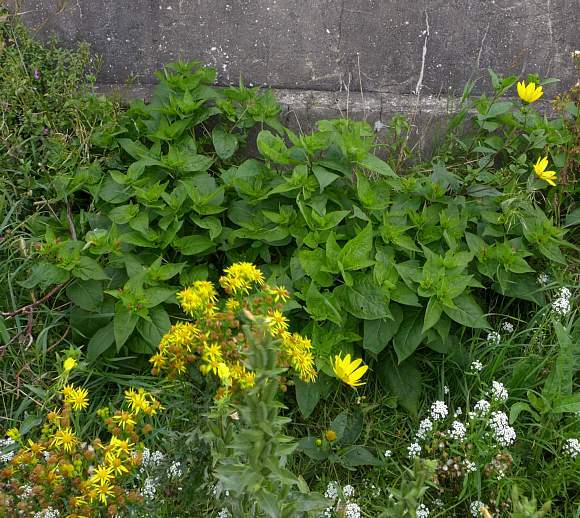 The plant nearest the wall behind the Common Ragwort . 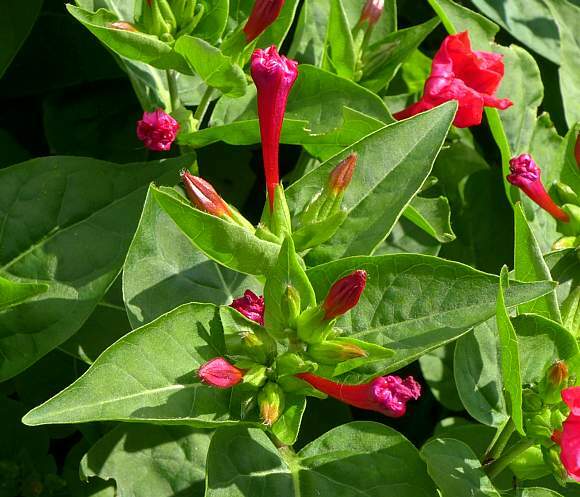 The red flowers are just small buds and not yet open; come September they will be. It is a garden plant, an alien introduced-survivor. 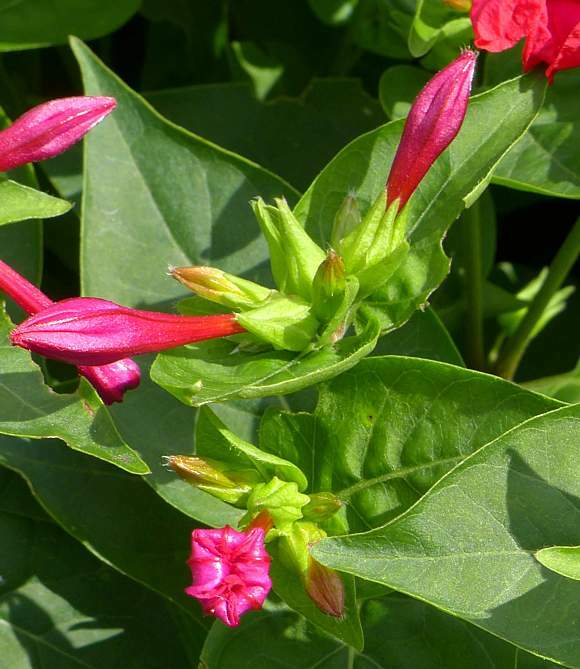 It is the most commonly grown ornamental species of Mirabilis that is grown in gardens. It's now September, and the flowers are open. An erect and branched perennial growing to 1m, this specimen is considerably shorter. Leaves are ovate and pointed. 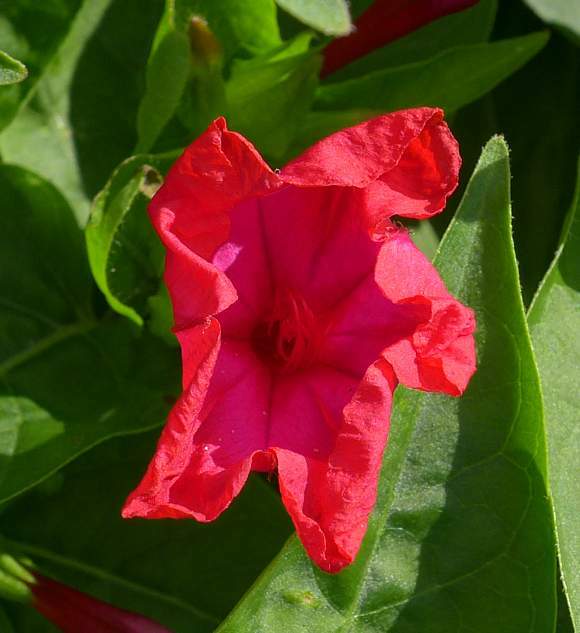 Flowers red, with a long narrow tubular section which abruptly flares to a wide opening. 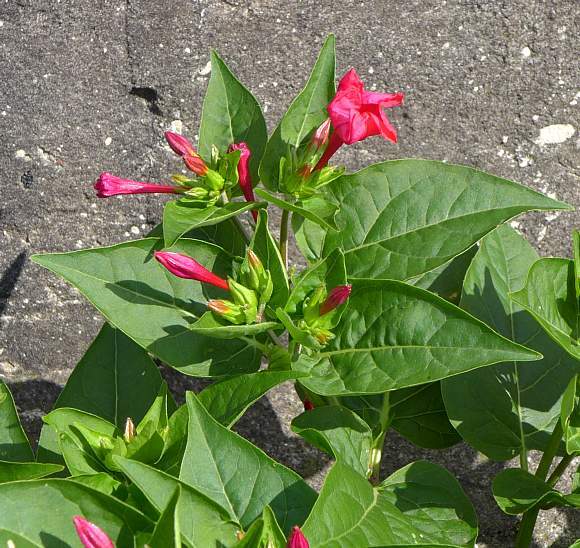 However, differently coloured flowers can even occur on the same plant, such as red and orange bi-coloured flowers or red any yellow bi-coloured flowers. Spots are also common. White-purple bicolours and white-yellow bicolours are also possible. Moreover, the flower colour on each individual flower can change as the plant matures - thus white flowers can change to pale violet, and yellow to a dark-pink colour. These colour changes are no doubt due to the changes in composition of the Betalains. The leaves are either hairless to sparsely hairy (sparsely hairy on this specimen). Before opening, the end of the flowers look like a Philips Screwdriver, albeit one with 5 splines rather than four. The flowers emerge from a toothed 'calyx'. The teeth of the 'calyx' are actually fused together over most of their length apart from the very end. 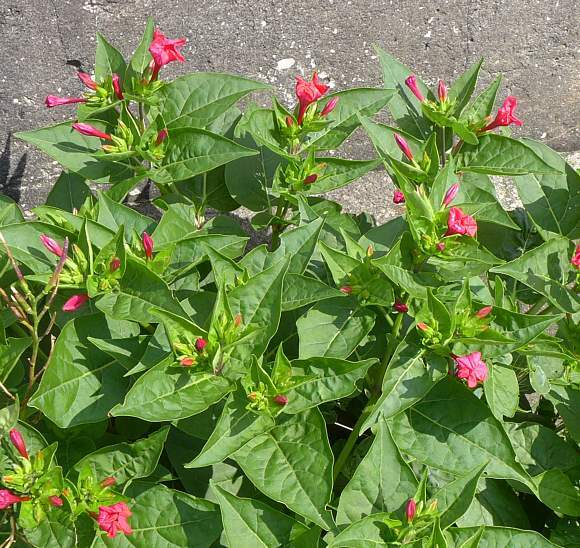 The 'calyx' is actually an involucre of bracts. 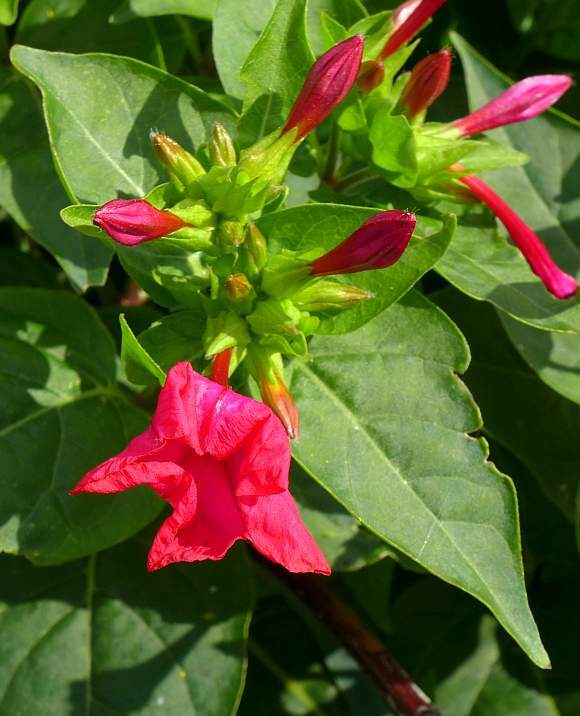 It is the 'petals' which are in fact pigmented modifications of the calyx. Confused? So, it seems, is this plant! In addition to the chemicals mentioned below, Marvel-of-Peru also contains the steroidal compounds Campesterol, Daucosterol , Brassicasterol and β-Stigmasterol . 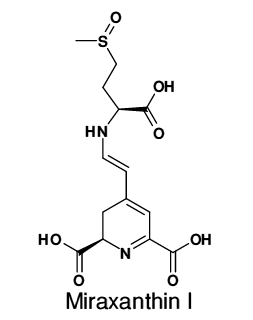 Also, the TriTerpenoids α-Amyrin, β-Amyrin, Oleanolic Acid and Ursolic Acid. 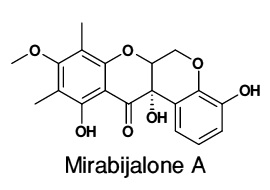 The diterpenoid Mirabalisol is also found as well as the methyl-Betaine Trigonelline which is also found in Fenugreek (Trigonella foenum-graecum) from which plant it was named. The Betalains are indole-derived pigments replacing anthocyanin pigments in plants belonging to the Caryophyllanes and in higher-order fungi. The deep colours of Beets (and other cultivars of Beta vulgaris ), Bougainvillea, Amaranth and many cacti owe their deep colours to these compounds. There are two categories of Betalains: BetaCyanins (which are not present in Marvel-of-Peru) and BetaXanthins (which are). Betalain pigments and AnthoCyanin pigments are mutually exclusive,- no plant ever produces both, but sometimes those producing Betalain pigments also produce AnthoXanthins . Most members of the Caryophyllanes produce betalain pigments; only two families within the Caryophyllanes produce AnthoCyanins instead of Betalains, namely the Caryophyllaceae (Carnation) family and the Molluginaceae family. The production (or not) of Betalains is now used diagnostically in Taxonomy. The colour of all Betalains is due to the oscillatory twisting of the C=N double bond which induces larger rotations about the C=C bond just beneath it in the structural formulae diagrams. 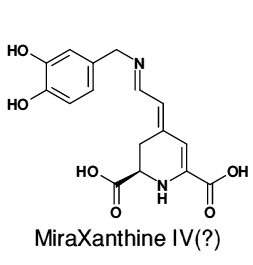 Your Author wonders if this might mean that MiraXanthin I and MiraXanthin II are not coloured by this resonance, seeing as both these lack the requisite C=N bond (being replaced by a C-N bond, which is therefore free to rotate continuously rather than twist clockwise and anticlockwise like a clock escapement with hairspring balance wheel). Betalains perform a photoregulation and hormone control role in plants. These are yellow to orange coloured Betalain pigments and include VulgaXanthin , MiraXanthins , IndicaXanthine and Portulaxanthin (present in species belonging to the Portulaca genus), only the latter compound has not been found in Marvel-of-Peru. 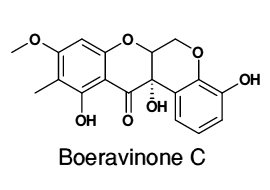 Betaxanthines cannot be hydrolysed by acid to strip them of any sugar moiety without also fundamentally changing their chemical structures. They are shown here as the aglycones, without their sugar moieties. 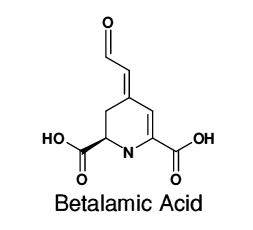 The BetaXanthines are based upon a Betalamic Acid moiety. 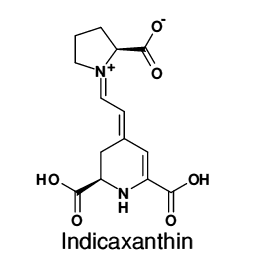 Indicaxanthin is a powerful anti-oxidant present in Beets (Beta vulgaris spp), in Marvel-of-Peru and in cacti such as Prickly Pear (Opuntia genus). It has charge-separation on the 4-valent nitrogen atom, and is therefore a zwitterion as are many betalaines. 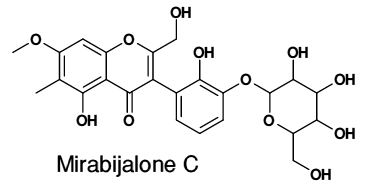 Indicaxanthin was first found in the dye extracted from the fruits of Barbary Fig aka Prickly Pear Opunti ficus-indica, a species of cactus which has long been domesticated in semi-arid parts of the world as a crop plant. Barbary Fig has orange, yellow or white flowers, but the colour of the fruits the dye is extracted from are bright red to purple or yellow to white. The juice of the fruit, which is red in colour, contains both Betanin and Indicaxanthin. The colour of the mixture of Indicaxanthin (yellow-orange) and Betanin (purple) is highly dependant upon the pH (as you might expect for a Zwitterion with separated positive and negative charges). Dying at pH 4 yields optimum results. Various metal salts added as mordant improve light-fastness, but un-mordanted wool already has good water and washing fastness. 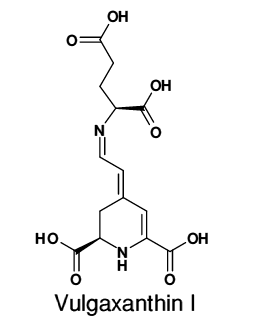 There are five Vulgaxanthines known, I to V, but only VulgaXanthin-I has been reported to occur in Marvel-of-Peru. 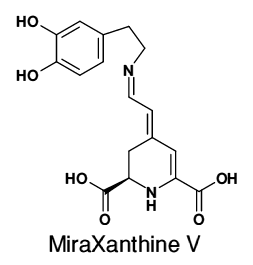 Miraxanthine V and Miraxanthin III are closely related to each other; both contain a Dopamine (aka 3,4-DiHydroxyPhenylEthylAmine) moiety in their structure. Dopamine is one of the main neurotransmitters in the mammalian brain out of the dozens that have now been found operating within it. Dopamine itself is found within the petals of the flower. 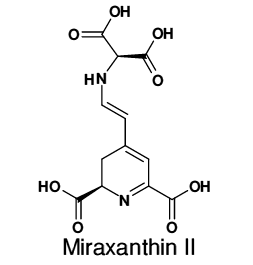 The structure of Miraxanthin IV is not certain, because it does not occur in sufficient quantities to determine. 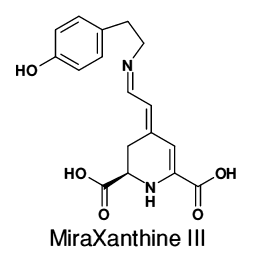 Instead of the Dopamine moiety in Miraxanthin V and III, Miraxanthin IV, as depicted, has a 3,4-DiHydroxyPhenylMethylAmine moiety attached to it. This moiety is also an important neurotransmitter of the Catecholamine type in the mammalian brain. Several years ago it was discovered that certain flowers petals fluoresce, but there aren't many plants which do this. One of the first flowers to be found fluorescing was Marvel-of-Peru. The visible-light fluorescence of a yellow betaxanthin in the petals is absorbed by a violet coloured betacyanin, creating a contrasting fluorescent pattern on the petals. The yellow areas of petals, when illuminated by blue light, emit a green fluorescence which is due to betaxanthins. But in the normally orange areas of the petals, which also contain Betanin, the green fluorescence is absorbed by that Betanin. The pollen of this flower also fluoresces under ultraviolet light, this time with a green glow. But Marvel-of-Peru is not the only flower to fluoresce under UV, amongst the others are Blanketflower (petals yellow and reddish-purple), Bee Balm , Hollyhock (stigmas white, petals dark red), Hawthorn , (filament blue, petals purple). However, in most (all?) of those flowers which fluoresce, the intensity of the fluorescence is usually negligible (except perhaps in Marvel-of-Peru flowers) in relation to that of the visible light impinging upon the flower (remember that ultraviolet is only falling on the flower when the sun is shining - there is no other naturally produced source of ultraviolet photons (except from lightning bolts, but they are transient and of no help to the flower in attracting pollinators). [It is not natural for someone with an ultraviolet LED source to 'dark-illuminate' flowers at night to see if they fluoresce]. But it is also important to realise that fluorescence does not exclusively rely on illumination by the higher energy ultraviolet radiation; in the case of Marvel-of-Peru the lower energy light wavelengths of blue light excite the fluorescence of betaxanthins to re-emit the blue light as green light (which is of lower energy still). Other dyes found within plants (not necessarily in their petals) which fluoresce are the NaphthodiaAnthrone Fagopyrine (which is a red pigment found in Buckwheat) The yellow Berberine found in the sap of Greater Celandine fluoresces yellow under UV. Vitamin B2, found in many plants such as vegetables, is a yellow dye with a yellowish-green fluorescence. Harmine found in Blue Passionflower fluoresces green under UV illumination. Chelirubine found in Californian Poppy glows blue under UV illumination. The Quinine (also contained in Angular Solomon's-Seal) and a constituent of Tonic Water fluoresces blue/cyan under UVA illumination. 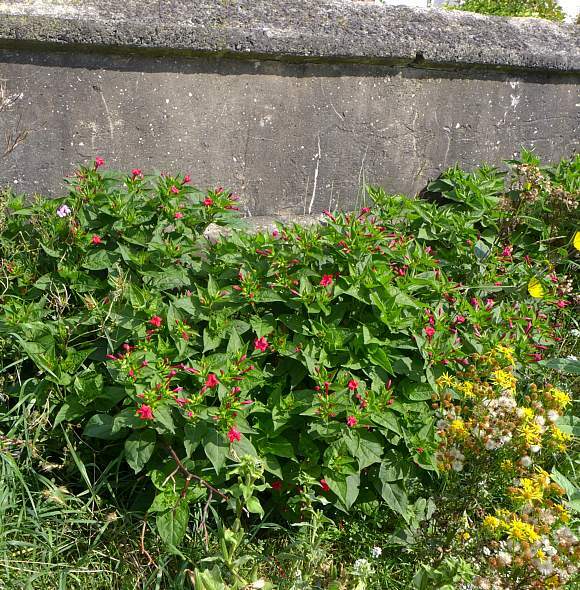 Hypericin found in St. John's-wort s such asSlender St. John's Wort is a red-orange coloured naphthodianthrone chromophore which fluoresces and can cause skin to be photo-sensitized, which can remain for the rest of the animals (including humans) life. Methyl Anthranilate (aka Methyl-2-AminoBenzoate) is a pale yellow liquid with a light-blue fluorescence under UV light is found in Garden Strawberry. Duke of Argylle's Teaplant contains the Coumarin Scopoletin which on absorbing UV fluoresces with a blue glow and is used in sunscreens. Thamnolic Acid which is contained in lichens of genus Thamnolia fluoresces blue under UV. Many other lichens fluoresce under UV illumination from a variety of fluorescent compounds many contain, and by which means sometimes identification can sometimes be determined (with the help of other characteristics). Pigments based upon Pteridine such as Leukopterine , Xanthopterine , isoXanthopterin, Erythropterin, Sepiapterin and Biopterin , which are all found in species of Butterflies , fluoresce in a variety of colours. [NOTE: Fluorescence aways involves the absorption of photons of higher energy than those that are emitted - the energy of the photons being higher for UV, and decreasing in energy in rainbow order: violet, indigo, blue, green, yellow, orange, red. Although, under the right circumstances, some substances can absorb two photons of light simultaneously, and then have the capability of emitting just one photon at a higher frequency than that of the two absorbed photons. But for this to work, the 2 incident photons must be almost simultaneous - and for this to happen frequently enough for the resultant fluorescence to be detectable means a very powerful light source such as from a laser - the Sun just is not bright enough for many photons to be almost simultaneously absorbed in pairs!]. 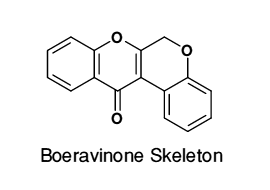 Rotenoids are chemically related to IsoFlavones and have a skeleton consisting of two units fused at the cis-position. They are characterised by Rotenone , a toxic insecticidal compound found in several non-native plants and reportedly also found in Great Mullein (Verbascum thapsus). 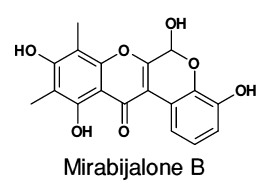 Rotenoids are also found in members of the Nyctaginaceae family of plants, which includes the genera Boerhavia in which Boervinones were first found and Mirabilis in which Mirabijalones were discovered. 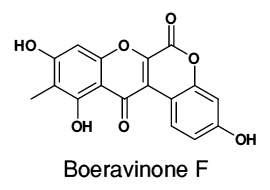 There are many other families of Rotenoids. 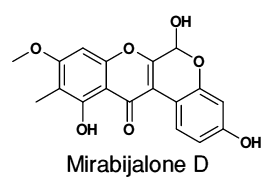 Mirabijalones are named after this plant in which they are found. Mirabijalones have the same Rotenoid skeleton as do the Boeravinones. 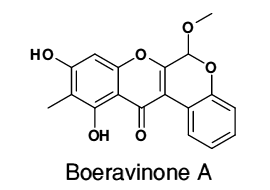 The boeravinones are found in the roots of Marvel-of-Peru along with Glycerin MonoEicosate and β-Sitosterol . Boeravinones are also found in the Boerhavia genus of the same Nyctaginaceae family to which Marvel-of-Peru belongs. 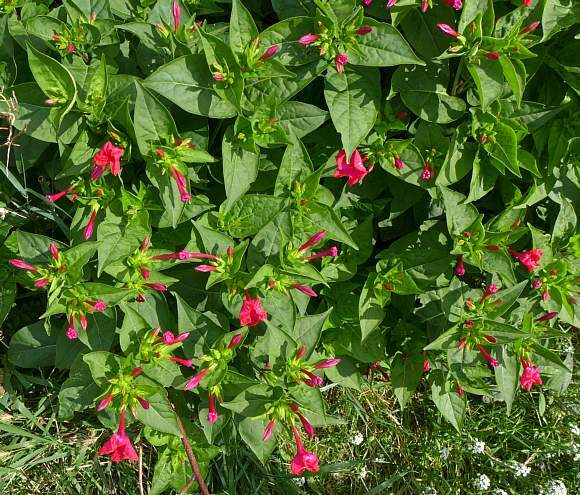 But no plants of the Boerhavia genus are found growing wild in the UK.